Life Imitating Clay It's a monster with huge teeth... and a fluffy tail. A mutant rabbit hops off the screen and attacks innocent veggies in northern England. Beware the behemoth bunny. 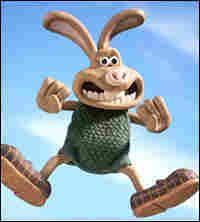 Folks in northern in England are trying to stop a monster rabbit from ravaging their village. "It's very big -- it's nearly the size of a dog... It's eating everything, all the vegetables. They are trying to shoot it... but I think it's too crafty." The wascally wabbit has gobbled up turnips, leeks and other garden goodies... leaving only giant paw prints at the scene of the crime. "This is no ordinary rabbit," says Jeff Smith. "We are dealing with a monster... It is absolutely massive. The first time I saw it I thought to myself 'What the hell is that?'" An attorney for the Easter Bunny denies any connection to the attacks, saying his client hasn't torn up a garden since attending rehab.